This post was written by cognitive neuroscientist Dr Muireann Irish of Neuroscience Research Australia. We are usually told that daydreaming is a waste of time and mental power, but the ability to daydream offers us tremendous flexibility in our daily lives. The frequency with which we daydream suggests it is not only normal, but an essential part of life. In fact, the capacity to daydream may hold an evolutionary adaptive value that sets us apart from other animals and enables us to function successfully. It has been suggested that daydreaming facilitates creative problem solving, such as that “eureka” moment in the shower. Research on creativity has pointed to the importance of distractions during demanding tasks, to facilitate a creative period of incubation. During these periods, we loosen our thought processes to find solutions to problems using previously unexplored options. Other research suggests that our sense of identity is enhanced when we daydream. By continuously remembering events from our past and envisaging what our futures might be like, we form a stronger sense of who we are as individuals across subjective time. Now, research has shed light upon the regions of the brain that are crucial for imagination and demonstrated that the capacity to think beyond the current moment is disrupted in dementia. The brain is never truly at rest. Neuroimaging studies consistently demonstrate that when we daydream and imagine alternative scenarios, a complex network in the brain fires up. Activation in this “default network” is observed across a number of key brain regions including structures in the prefrontal cortex, medial temporal lobes, and regions located deep inside the parietal cortex. Remarkably, this brain network is recruited whenever we remember the past or imagine the future. These findings suggest that we may have evolved to consider alternative perspectives, which confers a great deal of flexibility in our everyday lives. Rather than actively engaging in certain behaviours, we can test our actions in advance by mentally envisaging their outcome and avoiding costly mistakes. The default network is also active when we imagine what someone else may be thinking or feeling. This ability to appreciate the perspectives of others allows us to function successfully in the social world and to demonstrate empathy and understanding toward others. Imagining things comes naturally to most of us and so we often take this skill for granted. But consider if you no longer had the luxury of daydreaming. What would it be like to remain anchored in the present moment with no option to go backwards or forwards in time? By continuously remembering events from our past and envisaging what our futures might be like, we form a stronger sense of who we are as individuals across subjective time. For individuals suffering with dementia, the ability to daydream and forecast the future is lost. My research has revealed that damage to key structures of the brain’s default network in dementia blocks the ability to daydream. In a study published recently in the journal Cortex, my colleagues and I tested the ability of people with Alzheimer’s disease (AD) and frontotemporal dementia (FTD) to remember personal events from the previous year. We also examined whether they could imagine events that might occur in the next year. Both patient groups showed severe difficulties in remembering important events from their past, and these difficulties translated into an inability to imagine events in the future. We then conducted neuroimaging analyses of brain scans, and determined that damage to specific nodes of the daydreaming network is related to difficulties in remembering and future thinking in dementia. The brain regions implicated in past and future thinking differed in each dementia group. In Alzheimer’s disease, damage to a region deep inside the brain (in the parietal cortex) was strongly associated with impairments in remembering the past and imagining the future. This finding suggests that this parietal brain region is pivotal for both forms of thought. In frontotemporal dementia, damage to midline frontal brain regions was associated exclusively with problems in retrieving the past. Interestingly, damage to a different set of structures in frontal and temporal regions of the brain, including the hippocampus, related to imagination difficulties. Clearly, multiple brain regions need to be functional to enable us to remember the past and to imagine the future. Damage to any of these core brain regions produces severe impairments in allowing us to escape the present. For people with dementia, the world is anchored in the present. Their ability to remember the past gradually erodes, with only small islands or pockets of memories remaining. Losing the ability to recollect key events from the past strips us of our sense of identity as we cannot recall evocative and defining life events that have shaped us as individuals. While dementia patients do possess a future, it is out of reach as they are unable to envisage and look forward to upcoming events. Our research speaks to an important issue in dementia care, namely ensuring that the immediate environment of dementia patients is sufficiently engaging and stimulating to reduce feelings of boredom, agitation, and depression. By carefully considering how best to tailor the immediate environment to the individual, we can go some way to ensuring that living in the present is made as enjoyable as possible while we continue our search for dementia’s cure. For the rest of us, the next time someone reprimands you for daydreaming, it may be worth reminding them how complex and important this skill is in everyday life. To lose the ability to daydream, remember, and imagine, is to lose a fundamental piece of what makes us unique. This dreamy piece was written by the fabulous Dr Muireann Irish, Senior Research Officer, Neuroscience Research Australia. 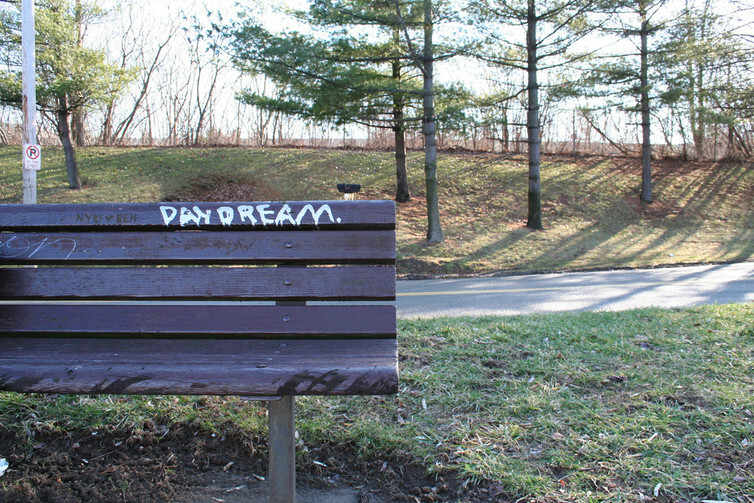 DayDream Believer was originally published on The Conversation. Read the original article. Really enjoyed this article by Dr Muireann Irish – very easy to understand. Fascinating. Applause for your work! I’m relieved to Learn of a potential benefit for my own wanderings. This may seem off topic, but makes me wonder as to how this might relate to meditation, a form of “being in the present” -a state that many work very hard achieve. I have gotten rather agitated at my significant other for constantly talking about his past, (he grew up locally) and he has quite a memory for first and last names of people I probably will never meet. I grew up on the opposite coastline and do not dwell in the nostagic past though I do love to daydream. What really struck me in reading this article though was thinking what a diservice it si for me to chastise my mate when I should remember and maybe off the side record names and events that at some age and stage might be helpful if he ever has dementia. It might be a story that in some area of his brain he might resonate with. I pray he never has dementia but it could also help me to remember names of those he talks about in the context of these stories when my tendency is to tune it out because it has no context for me. Yeh I get a lot out of meditation. It is a regular part of my life, but some argue we should be constantly in the present moment. For me this does not seem possible or healthy even. Reflection and planning are surely important too. This article helps explain and give a vocabulary to my misgivings. Being constantly present may not be bliss, it could be Alzheimers or Dementia. A very clear and concise article, easily understandable by non professionals.